Q: There is a lot of attention on the joint statement issued by the China-EU Summit. 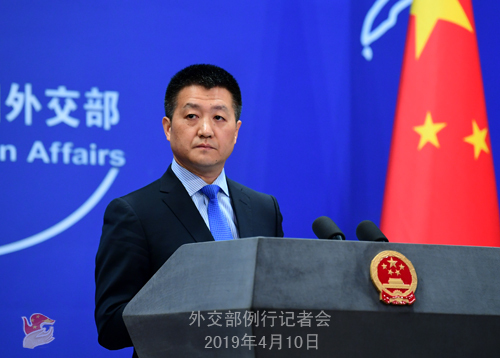 We noted that some media had exaggerated the divergences between China and Europe and said that the two sides would not be able to conclude a joint statement. But now the Joint Statement has been issued. What's your comment? A: On April 9, Premier Li Keqiang co-chaired the 21st China-EU Summit with President of the European Council Donald Tusk and President of the European Commission Jean-Claude Juncker. The two sides commended the progress achieved in China-EU relations in various fields and agreed that China and the EU share extensive common interests in deepening mutually beneficial and practical cooperation, have common position in upholding multilateralism and an open world economy and opposing protectionism and unilateralism, and share common goals in terms of improving global governance and upholding world peace and stability. The long-term steady and sound development of China-EU relations serve the fundamental interests of the two sides and is conducive to world peace and stability, which will have an important and positive impact globally. It is natural for countries to have differences with one another, and it is also quite natural that China and the EU don't always see eye to eye on certain issues. But the Joint Statement shows that the differences between China and the EU can be properly resolved through dialogue and negotiation, which testifies to the high level of the China-EU comprehensive strategic partnership, the solidarity and cooperation between China and the EU and the mutually beneficial and win-win spirit. As two anchors of stability and major economies in the world, China and the EU are commited to multilateralism and respect international law and the basic norms governing international relations with the UN at the core. Under the complex and fluid international circumstances, this Joint Statement demonstrates the resolve of China and the EU to stand in solidarity when multilateralism is being challenged. Its significance goes far beyond the bilateral relations. We stand ready to work with the EU to implement the consensus of this summit, elevate the China-EU cooperation to a new height and continue to make greater contribution to world peace and prosperity. Q: The Spokesperson for EU Foreign Affairs and Security Policy said in a press conference today that the verdict rendered on the "Occupy Central" case in the Hong Kong SAR will have a negative impact on Hong Kong's democracy and hoped the Hong Kong SAR and the central government will restart the election reform in accordance with the Basic Law. What's your comment? A: First of all, I would like to point out that the Hong Kong affairs fall within China's internal affairs and any other country has no right to interfere. 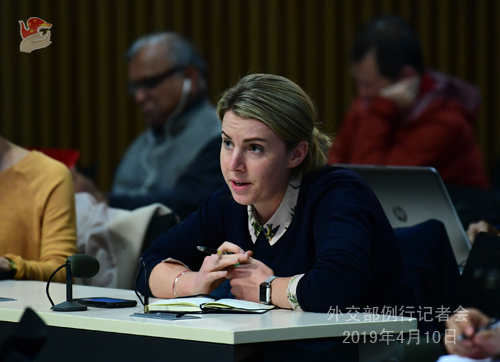 For one thing, such interference won't work at all; for another, it is not conducive to the sound development of relations between China and relevant parties. The Hong Kong SAR government promotes the socio-economic development within the framework of the Constitution and the Basic Law following the "one country, two systems" policy, which in itself is not a diplomatic affair. I'd refer you to the Hong Kong and Macao Affairs Office of the State Council, which is the competent authority of the central government, for a more authoritative answer. Q: First, the Organization of American States said Tuesday it recognizes the opposition leader Guaido's envoy as Venezuela's delegate to the regional body. I wonder what is your comment? Second, the US Treasury Secretary Mnuchin said on a congressional hearing on Tuesday that the US focuses on trying to secure IMF and World Bank resources to assist Guaido. I wonder what is your comment? A: There is something in common in these two questions, as they both concern the intervention in the situation in Venezuela from the international community. China's position on the Venezuelan issue is consistent and clear. We support the government and opposition in Venezuela in seeking a political settlement through dialogue and negotiation. We believe that the international community should contribute to stability in Venezuela on the basis of international law and the basic norms governing the international relations including non-interference in others' internal affairs and provide more constructive assistance to resolve the issue rather than doing the opposite. China will continue to support the Venezuelan government's efforts to uphold its sovereignty, independence and stability. Q: According to Australian media reports recently, the Telecommunications and Other Legislation Amendment (Assistance and Access) Bill 2018 forces telecommunications companies to install "backdoors" for the Australian government. Many tech companies including Google, Apple and Amazon have voiced serious concerns, saying it poses a threat to cyber security of Australia and other regions. Do you have any comments? Earlier, the Australian side said that they didn't want anyone in their communications networks that have an obligation to another government, and banned Huawei from its 5G networks for this reason. Do you think Australia is applying double standards here? A: China is closely following the relevant developments. Forcing companies to install "backdoors" through legislation means protecting one's own security and interests at the expense of other countries' security and their people's privacy. Such practice will severely impact the business environment of and international cooperation in the telecommunications industry. As we have seen, those in the industry have raised serious concerns. It is baffling how the country concerned could whip up "security threats" posed by other countries or companies with trumped-up charges under the facade of cyber security while engaging in acts that endanger cyber security themselves. Like you, I also wonder what the Australian government will say about this. China attaches high importance to and is committed to safeguarding cyber security. We will continue to take an active part in international cooperation in this field and work with all sides for a peaceful, secure, open, cooperative and orderly cyber space. 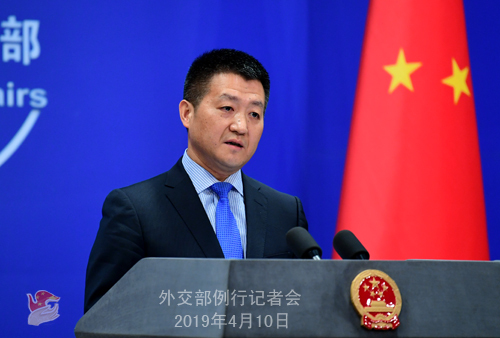 At the same time, China again urges relevant countries to provide a fair, just and non-discriminatory business environment for companies of all countries, including China. Q: The Dalai Lama has been admitted to hospital with a lung infection. What's the Foreign Ministry's comment on this? Does China have a plan to appoint a successor to the Dalai Lama in China? My second question, US Deputy Assistant Secretary of State David Meale is scheduled to speak in Taiwan tonight at the American Institute in Taiwan. Are you aware of this and what is China's view on the US government representative's visiting Taiwan? A: Let me take your second question first. China opposes any official contacts between the US and Taiwan. We believe that this severely violates the One-China commitment the US has made and its obligations under the three China-US Joint Communiques. We demand that the US not take such wrong move. Regarding the first question, first, we are not aware of what you said about the physical condition of the 14th Dalai Lama. Second, in China's history, clear rules have been established concerning the reincarnation of the living Buddha. Reincarnation of living Buddhas, as a unique institution of inheritance in Tibetan Buddhism, comes with a set range of rituals and conventions. The Chinese government implements the policy of freedom of religious belief. The reincarnation system is respected and protected by such legal instruments as Regulations on Religious Affairs and Measures on the Management of the Reincarnation of Living Buddhas. Q: The Acting US Defense Secretary said that the key mission for the proposed US Space Force will be to develop technology needed to respond decisively to aggression by China or Russia against America in outer space. I wonder what is your comment? Second question, the US Defense Security Cooperation Agency said that the US has approved a possible 1.1 billion sale of 56 SM-3 anti-ballistic missiles to Japan. I wonder if China is concerned about it? A: To answer your first question, outer space belongs to all mankind and should be used for peaceful purposes. As you are well aware, China upholds the peaceful use of outer space and opposes the placement of weapons there. China, Russia and most members of the international community have long been promoting the efforts to conclude an international legal instrument through negotiation on multilateral occasions including the Conference on Disarmament. As you may have noticed, the relevant UN expert panel has also been making tireless efforts to facilitate the negotiation process. However, to our regret, all the efforts devoted have been blocked by one country over the past years. And that country is the United States. There indeed are some negative developments in outer space recently that raised concerns from China, Russia and other members of the international community. For example, the US has described outer space as a new war-fighting domain, announced its decision to build a space force, planned to deploy anti-ballistic weapons and long been engaging in military drills in outer space. Such moves are not only turning outer space into a war-fighting domain deployed with weapons but also adding the risks of an arms race. If the US truly cares about the security and non-weaponization of outer space, it should stop taking such moves and sincerely join the majority of the members of the international community, including China and Russia, to make joint efforts to prevent weaponization and make peaceful use of outer space. Now come back to your second question, we have noticed the relevant media reports. The US-Japan Security Alliance was forged during the Cold War. We hope communication and cooperation between relevant countries can contribute to regional peace and stability instead of doing the opposite. Q: Media reports say 796 lost Chinese artworks and artifacts were sent back from Milan, Italy by plane on April 9, and they have officially set off for home. Can you tell us more details? A: Indeed, those lost Chinese cultural items returned by Italy have already arrived in Beijing early this morning. They bear our nation's memories and have been abroad for many years. Now we are glad that they finally come home. As far as I know, China's National Museum will host a special exhibition of these valuable items that you may go and see. As you may recall, on March 23, President Xi Jinping and Prime Minister Conte witnessed the exchange of certificates for the repatriation of the Chinese cultural artworks and artifacts between representatives of China and Italy. I'd like to specifically mention that this is the biggest return in the past almost 20 years. It is a milestone of China-Italy cooperation on cultural heritage and a new model of international cooperation for the repatriation of lost cultural items. China highly commends that. China and Italy, both ancient civilizations and home to a large number of cultural artifacts, have long been cooperating in the preservation and restoration of cultural items and the fight against artifact-related crimes. We are ready to enhance communication and cooperation for better protection and preservation of global cultural heritage. Q: The USS Wasp is currently going through the disputed waters near the Philippines, specifically the shoals. I'm wondering if you have any comments on that? A: I may need to check on the specific situation. I can tell you that the principled position of the Chinese side is that we hope non-regional forces will refrain from stirring up troubles in the calm South China Sea.